Our new 8.8 megawatt heat-and-power cogeneration technology at our Camarillo Greenhouse is the first of its kind in the United States to capture traditionally wasted heat, water and C02 for use within the greenhouse. Having successfully completed the California installation, we are in the process of trying to bring the same technology to our Delta, BC facility. Houweling Nurseries Ltd. (dba, Houweling Tomatoes) operates a 20-hectare greenhouse facility in Delta, B.C., producing both fresh tomatoes and propagated vegetable seedlings for other greenhouse vegetable growers. The heat and CO2 requirements are supplied by five natural gas fired boilers which have an estimated efficiency of approximately 84%. The estimated emissions produced by the current operation of the natural gas fired boilers is 23.7 tonnes annually. The boilers operate throughout the day to produce heat which is stored in a 1.5 million gallon reserve tank and subsequently used as required in the greenhouse. Some amounts of the CO2-enriched exhaust is used to promote a healthy crop and vegetable production. An additional 1,000 tonnes of liquid CO2 is purchased for our seedling propagation department, as the CO2 generated from the current system is not acceptable for growing seedlings. This limitation creates additional waste during the months of October to February as crop production is reduced and seedling propagation is at its peak production. During this period the boilers are only in operation for heating generation. As a result, the exhaust from the boilers is released into the atmosphere, while liquid CO2 must still be purchased. 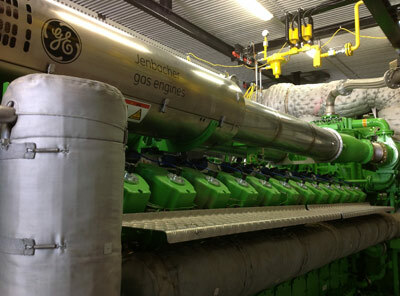 Houweling’s Tomatoes proposes the installation of two 4.4 MW GE Jenbacher natural gas fired, combustion engine driven, cogeneration units. Cogeneration (cogen) through combined heat and power (CHP) is the simultaneous production of electricity with the recovery and utilization of heat. The CO2 enriched gases from the engines will be treated using selective catalytic reduction (Hanwel COdiNOX system) to reduce the NOx levels in the exhaust, meeting the requirements of the seedling crops as well as promoting healthy crop enhancement in our tomato production area. This flue gas cleaner ensures the flue gases from CHP gas engines are converted into food grade CO2, which can then be used immediately for plant and seedling fertilization. This will eliminate the need to purchase, transport and store liquid CO2. The anticipated emissions from the Co-Gen units will be less than 11.5 tonnes annually, reducing our emissions output by at least 50%. To view the complete air modeling report: click here. Additionally, Houweling's will also be able to offset our electrical purchasing requirements during high use periods. In the summer months, the greenhouse experiences periods of high CO2 needs and reduced electrical demand due to longer daylight hours and warmer temperatures. As a result, excess electrical generation is available to be supplied to the BC Hydro grid. During winter months, additional electrical energy will be purchased as the units will not meet our total demands. The engines will be housed in a sound proof enclosure, eliminating any potential noise pollution. From an environmental aspect, our annual emissions will be greatly reduced through better control of combustion, as well as the implementation of the CodiNOx system. The operational hours of these units will be based on our existing heating and CO2 demands. This ability to produce our heat and CO2 needs as well as electrical energy as a bi-product, with an overall efficiency rate exceeding 98%, would seem to be the best utilization of the natural gas resource; allowing Houweling’s Tomatoes to supplement our electrical needs when required and return power to the grid when a surplus is available. Houweling‘s anticipates excess production of 40,000 MWH of electrical energy available to be returned to the electrical grid through the SOP program offered by B.C Hydro. At this point in time Houweling’s has submitted the modeling reports and emissions permit application to Metro Vancouver.